Where Do You Start In Sustainability? With This Book! As a business owner, your focus is business. Pushing your company forward in the marketplace is paramount, but other issues are important, too. One of prime importance today is the environmental movement. It is swirling around you, but you are not sure how you fit into it. The best place to get your footing on the discussion is to read this book, Green to Gold. It was written by two Yale professors. It is a clear and concise argument on why it is imperative that your company move to sustainability and in addition, why it gives your company capitalistic profit and competitive advantage. They present the business case for why businesses should ultimately transform themselves for sustainability. It explains why the smartest leaders are moving now in this direction by citing big name corporate examples. It does not sugar coat and presents the pitfalls, too. Besides presenting the imperative message that businesses must see sustainability as an opportunity to change for the better and not be viewed as a threat, the book then becomes a playbook of green strategies and actions. 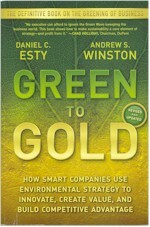 Green to Gold encourages rational thinking on how to integrate environmental strategies into business while familiarizing you with the issues and jargon. This book is the starting point to formulate your company's position on sustainability.